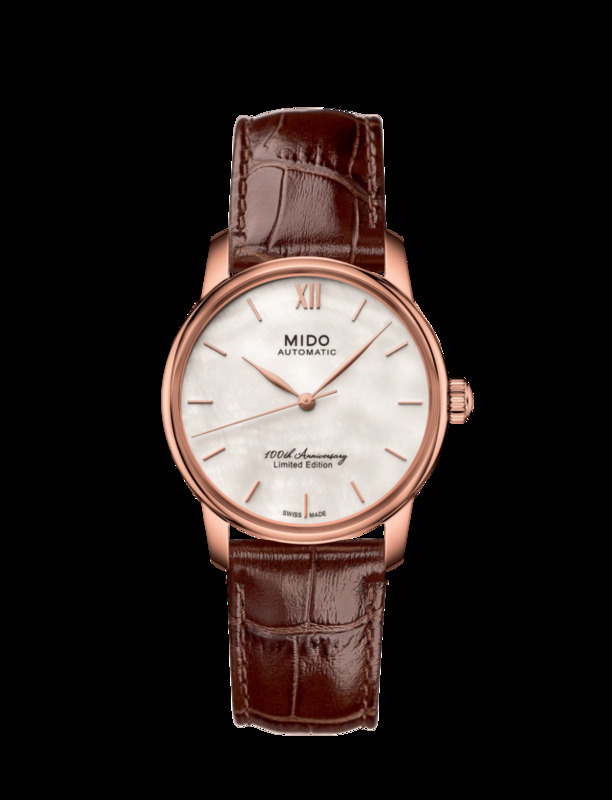 Mido celebrates its first century in style with a series of nicely designed and affordably priced dress watches (including the excellent Mido Multifort Datometer). 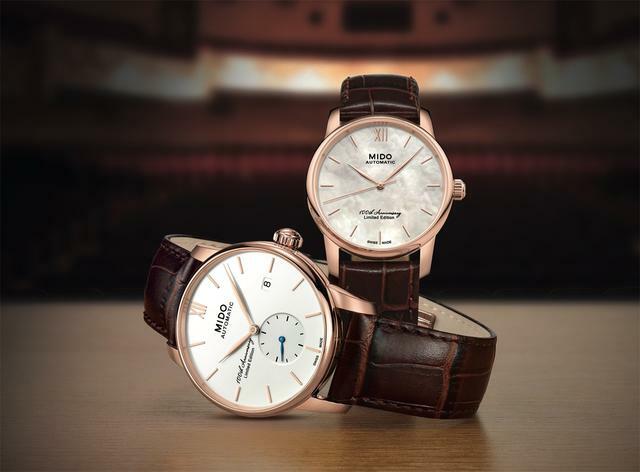 The newest examples, the Baroncelli 100th Anniversary Limited Editions, exude class in two sizes (38mm and 33 mm), each a limited edition of 1,918 in honor of Mido’s founding year. Let’s start with their polished steel cases, treated with rose gold PVD. Gold is always a good choice with anything formal. 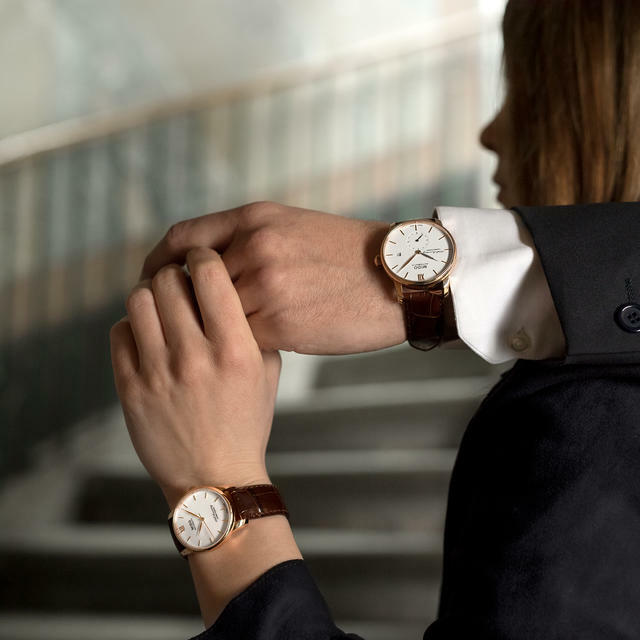 For the smaller version designed for women you’ll see a white mother-of-pearl dial; the larger model (with a date) would frankly look good on any wrist regardless of gender and offers a finely polished and laquered ivory dial. 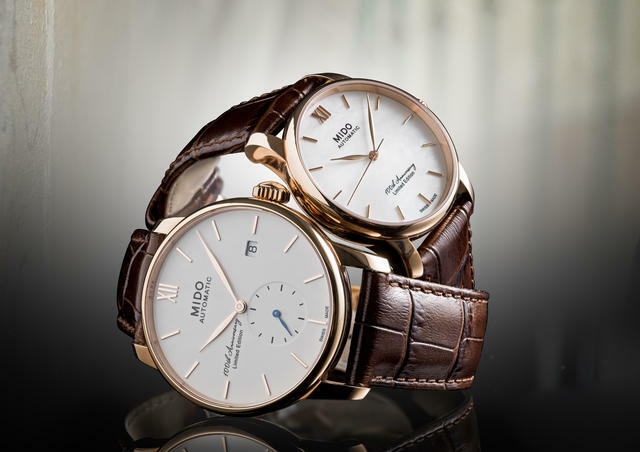 Both pieces feature a Mido 100th Anniversary logo, perhaps less discreet than necessary, but not too distracting. Look closer and you see more details that enhance the attractivnesss of this design. Note the cleanly stamped and rounded leaf-shaped hour and minute hands and the polished applied indexes. Both glow with a rose gold PVD treatment. The blued small seconds hand on the larger model is the perfect accent, which Mido knows all too well. The brand’s designers have placed a small seconds indicator at 6 o’clock on many of its watches since 1934. And Mido has thoughtfully sized the crown so that it can actually be used by standard-sized male thumb and finger. 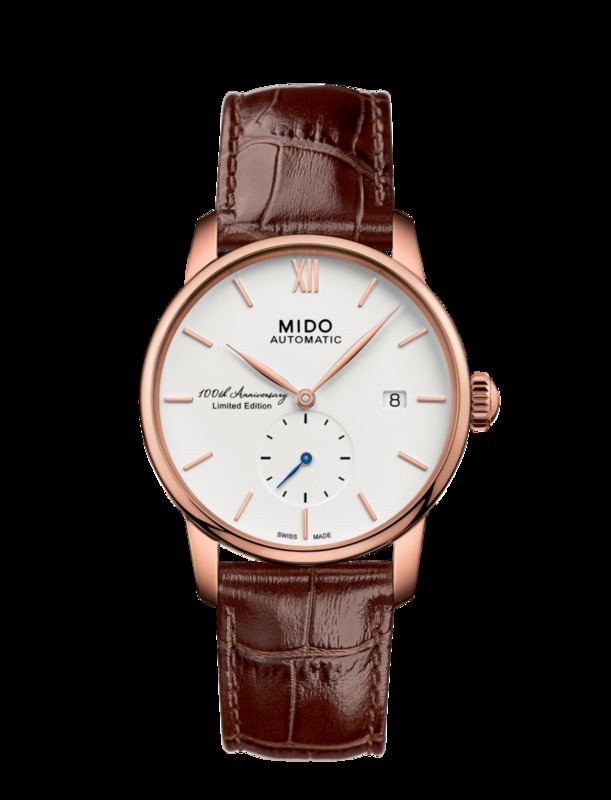 Mido places an ETA automatic movement inside each watch (see below for specifications) and makes the movement visible through a clear sapphire caseback. The movement’s oscillating weight is adorned with the Mido logo. Both these watches are water-resistant to 50 meters and each is fitted with a glossy brown crocodile-look leather strap. These limited editions are priced at $1,260 and $1,070 for the men’s and women’s editions, respectively. They will be made available in April at us.shopmido.com. Movement: Automatic ETA 2678, finely decorated Elaboré-grade movement, oscillating weight decorated with the Mido logo. Functions: HMSD+Day. Up to 38 hours of power reserve. Case: Polished 33mm stainless steel case with rose gold PVD treatment, 3 parts, sapphire crystal with anti-reflective treatment on both sides, transparent case back, Limited Edition xxxx/1918, engraved serial number, water-resistant to a pressure of 50 meters. Strap: Glossy brown crocodile-look genuine leather, folding clasp in 316L stainless steel with rose gold PVD treatment. Dial: In white mother-of-pearl, polished applied indexes with rose gold PVD treatment. Hands: Stamped and rounded leaf-shaped hour and minute hands. Rounded diamond-cut central seconds. Movement: Automatic ETA 2825-2, finely decorated Elaboré-grade movement, oscillating weight decorated with Geneva stripes and Mido logo. Functions: Hours, Minutes, Date plus off-center seconds at 6 o’clock. Up to 38 hours of power reserve. Case: Polished 38mm stainless steel case with rose gold PVD treatment, 3 parts, sapphire crystal with anti-reflective treatment on both sides, transparent case back, Limited Edition xxxx/1918, engraved serial number, water-resistant to a pressure of 50 meters. 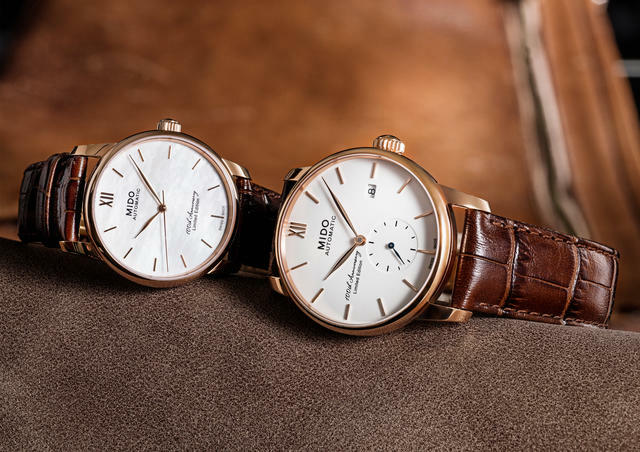 Dial: Ivory, polished and lacquered, polished applied indexes with rose gold PVD treatment. Hands: Stamped and rounded leaf-shaped hour and minute hands. Polished blued steel small seconds hand.